Essential oils command the prices they do because of the large amounts of plant material that go into the making of each small vial. Often, this cost exceeds what the beginning herbalist or fragrance crafter wants to pay. People with contact allergies to certain essential oils or who enjoy using their own plants also seek substitutes. Occasionally, artisan perfumers desire scents even more intense and complex than essential oils deliver. Fortunately, several substitutes for essential oils exist. Fragrance oils represent the most cost-effective alternative to essential oils. Made from synthetic ingredients, or synthetics mixed with small amounts of essential oils, fragrance oils make a reasonable choice for the beginning perfume or candle maker. They also easily substitute for essential oils. Fragrance oils' other advantage comes from the fact that some plants simply don't lend themselves well to distillation. Lily of the valley, lilac and fruit scents, for example, are available only through the synthetic magic of fragrance oils. Fragrance oils' disadvantages include their lack of therapeutic value, a scent quality some people find artificial or cloying, and their questionable appropriateness in skin care products. Safety is of special concern when it comes to using chemicals in skin care, warns Northwestern Health Sciences University. "The skin is the largest organ in the body and because of its substantial surface area, it has a greater potential than the stomach to absorb dangerous chemicals and pass them on in the blood stream," the university warns on its web site. Concretes and absolutes, in contrast to fragrance oils, are considered the most rare and exotic of all perfume ingredients. Removed through solvent extraction, concretes come from the waxy matter on flower petals. Concretes are semisolid and work best in solid perfumes. Perfumers make absolutes by removing the solid materials from concretes, resulting in a liquid even more concentrated than essential oils. "Absolutes are floral essences at their truest and most concentrated," reports perfumer and author Mandy Aftel. "They are much more lasting than essential oils and have an intensity and fineness to their aroma that is unequaled." For the enthusiastic gardener, infusing oils, water or alcohol with your own botanicals makes an excellent, low-cost alternative to essential oils. Creating your own infusions also gives you the ability to vary the scent intensity by continuing to replace botanicals in your base liquid until you're satisfied with the fragrance level. You'll extract the subtle colors and healing properties of your chosen botanical along with their scent. 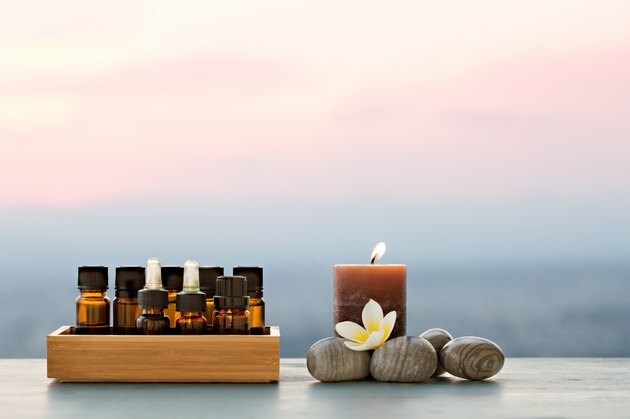 Keep in mind, however, that essential oils are among the most highly concentrated forms of plants available, and therefore homemade infusions won't match the fragrance or therapeutic value of essential oils. Some skincare products lend themselves well to adding dried herbs and flowers to the basic recipe. Obvious choices for crumbled or powdered herbs include bath salts, candles and soaps. As with herbal infusions, dried botanicals won't add as much fragrance as essential oils, and they can't be included in large enough qualities to truly be considered strong herbal therapy. However, dried herbs, especially used in combination with an infused herbal liquid, create subtly scented, all-natural products that make them intriguing and old-fashioned alternatives to essential oils.